Montenovi s.r.l. starts its activity in 1870 with Pietro Montenovi, its founder, and it is a company linked to a familiar tradition, on one hand, and to a professional tradition, on the other hand. It is a company which doesn’t renounce to be in line with the times, always evaluating the use of new materials, technologies and systems for the packaging, transport and the movement of works of art. Montenovi s.r.l. guarantees a high professional service either in Italy or in foreign markets, highlighting the choice to serve institutional clients and exhibitions sponsored by the “Ministero per I Beni e le Attività Culturali”. Nevertheless, Montenovi respects the highest qualitative standards imposed by the Italian institutions and the international illustrious ones, too. Montenovi s.r.l. has collaborated with ICR, the Central Institute for the Renovation, for the study and the realization of new kinds of technologies for the packaging, thanks to the use of composite materials, not applied in the field of the works of art protection and movement. An example is the protective packaging, used for the expedition of the “Satiro Danzante” from the Satiro Museum in Mazzara del vallo to the Aichi EXPO in Japan. For this work of art it has been created a “corset” in carbon fibre and Kevlar and a double case with a computerized control chip for the monitoring second by second of the microtraumas and the climate variations inside the case. Montenovi s.r.l. starts its activity in 1870 with Pietro Montenovi, its founder, and it is a company linked to a familiar tradition, on one hand, and to a professional tradition, on the other hand. 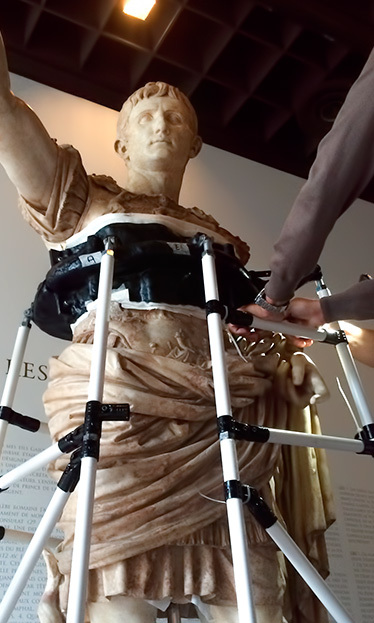 Packaging, handling and shipping of the sculptural complex of Michelangelo’s “La Pietà ‘” the Vatican museums. From 1 April to 6 November of 1994, the handling at Palazzo Grassi hosts “Renaissance from Brunelleschi to Michelangelo” the most comprehensive exhibition ever created on the architecture of the Renaissance presented today to journalists. For the exhibition is given by the completion of the restoration of the extraordinary wooden model of St. Peter’s Church, built to a design by Antonio da Sangallo in 1539. Handling “Bronzi Di Riace” and First Italian company to ship and set up a work of the Italian State “Fresco by Botticelli” in Israel with exposure to the Museum of Jerusalem. Dismantling at the headquarters of the Bank of Italy in Via delle Quattro Fontane in Rome with mammoth work handling, packaging and transport to the headquarters of the Bank of Italy in Vermicino for unloading, unpacking and installation in new stand for final settlement.